Traditional. Profound. Healing. Design a permanent resting place for your loved one. Burials are a traditional memorial choice that give families a meaningful physical symbol to mark a loved one’s resting place. 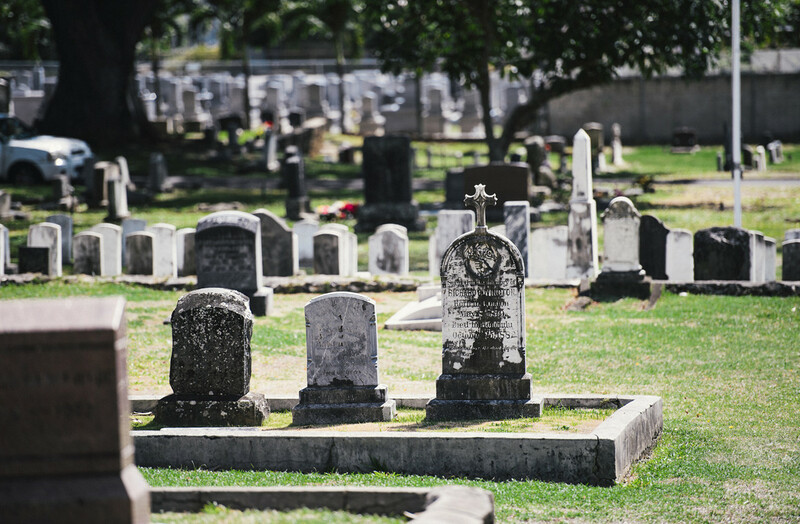 At Oahu Cemetery Association we offer a broad range of burial options, and we invite you to read about all that’s possible. We’re here to help you design a service and a physical memorial that will be a beautiful place to visit, forevermore. Express the life of your loved one and create a place for family and friends to gather. We can help you design a meaningful and healing service to take place at the graveside. These services can take place outdoors, in our chapel or even inside our mausoleum & columbarium. We’ll guide you through the process of personalizing both the service and the site in multiple ways. Working with your Funeral Director, you can select readings, speakers and create spiritual moments. You can include military honors, masonic rites and religious leadership. When it comes to memorialization, we offer many options. Your selection may include a flat memorial, upright monument, ledger, mausoleum plate, or memorial benches. Please reach us any time to begin the conversation. We’re here to share our expertise, with professionalism and compassion. A graveside service takes place after a funeral and can be a profound healing experience. Funerals often take place at the mortuary chapel or at your place of religious worship. In that case, an internment and committal service can follow at the graveside. These are important gatherings to commemorate a life and mark the end of physical closeness. Family and friends gather to commit a loved one to the earth and say final farewells together. A committal service is symbolic and a helpful step in healing. Together with your funeral professional, we can guide you through all of the arrangements. Burials are often an unexpected need, and we can handle every detail should this option make sense for you and your family. Please call us any time to discuss your needs. Our mission is to ease your burden. A funeral should be personalized to your loved one. If you have questions about your burial options, let us help. Contact us to select the ideal resting place. Design a site to express a life and gratify the living. A permanent resting place is something to consider carefully. Ask yourself about the kind of final resting place to best commemorate the life lost and provide a fitting place for family and friends to gather for services and future reflection. © 2019 Oahu Cemetery Association. All Rights Reserved.